Open to all ages. Come experience our Virtual Reality headset, the Oculus Rift. Experiment in a simple tutorial, try to beat the high score by keeping on rhythm, explore the world like a bird, or join in short stories. If you're hesitant or curious, drop by and enjoy seeing what others are experiencing. 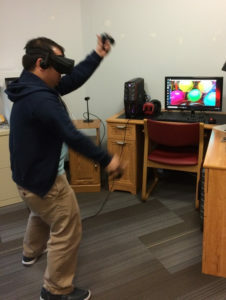 Virtual reality headsets are not recommended for children under the age of 13. Permission forms required for those under 13.